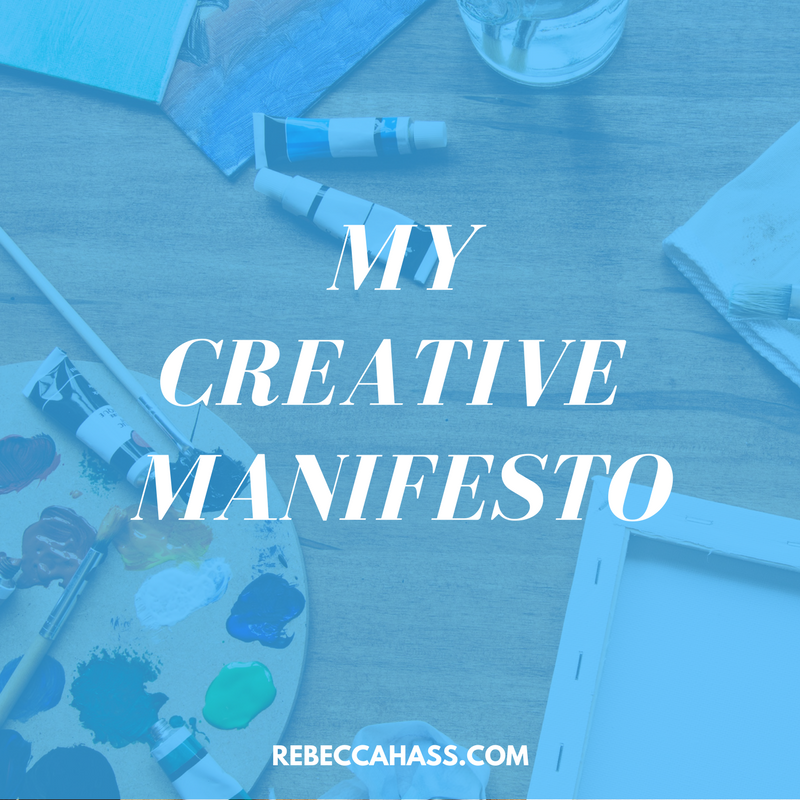 My Creativity Manifesto + Amazing News! I’ve had this document going for a couple years now, but I kept postponing posting it because it never felt done. I realize now that, of course, it didn’t feel done because a personal creativity manifesto is the kind of thing that’s always evolving! No one needs permission to create, or to call themself an artist, writer, musician, composer, etc.! We decide how (or how not) to label ourselves. It’s valuable to think of myself as creative - we miss out on some ways to be creative if we don’t think we are. Creativity has much less to do with talent than with consistent effort (supported by healthy habits). I have time to be creative, even if I think I don’t. I just also have to be creative with my time. People are also doing amazing creative things without realizing it - creativity shows up in so many places besides art. Don’t worry about creating something completely original that’s never been done before - work is original because it comes from a unique individual. Just make lots of things, some will be better than others - we have to make some bad stuff to get to the good stuff (and if we persist, we definitely will). Since creativity is a practice, different types of creativity feed the others, and the whole person (don't forget about physical movement). Draw inspiration from other disciplines and creative careers. The creative process is endlessly fascinating, in any format. I need to play and write music, or I start to feel a bit depressed and drained of life. Self-care is essential - not taking care of oneself is like slash-and-burn agriculture - nothing will grow if there are no nutrients left in the soil. Creating a sense of ease/flow around my creative habit helps “fertilize the soil”. Wellness and creativity depend on each other. I will continue to explore this interdependency. I don’t always have to know what I’m doing, in fact, maybe sometimes it’s better not to! I need enough white space in my schedule to support and make time for creativity. The “hustle” can make creativity (and my life force!) dry up. I need more time to process things, whether daily events, things I’m writing about, big successes/failures, or how to approach a project. Even though being an HSP (Highly Sensitive Person) can be difficult, sensitivity is also a super power for my life as a musician. Even if I feel fragmented (because the variety of a “mosaic of jobs” is a reality and a survival strategy), pieces can be rearranged to make something new and profound (or, the path may not be clear, but it sorts itself out, bit by bit). Prioritize joy - it’s most worth doing work that I’m excited about - creation is hard work but hard work can feel easy. I love working on my own, but also love making music with other people. As an introvert, I have to balance the two wisely. I need to be disciplined (as in forming a daily composing habit) but keep it fun enough that the work has room to breathe (also a balancing act). It’s really important for me to create a welcoming space for others to share their work, and to encourage others’ creativity. I will never: make someone feel bad about what they’ve created, discriminate based on style of music (or anything else), or pressure or guilt people around their creative habits. I want everyone to be able to feel: welcomed, inspired, capable, excited to make things, nurtured by keeping a creative habit, fearless (or fearful but doing it anyway), open to sharing their goals, and encouraging of others (a rising tide lifts all boats). We are all works in progress - art AND life are experiments. We all have permission to figure it out as we go (because that’s actually how it works). There’s no shame in utilizing external accountability if needed (yes, I’m an Obliger). I will share my process and journey openly, in hopes of helping others feel less alone. Where I am currently is right where I’m supposed to be in my career/life/etc. Creating the work is ultimately more important to me than any self-doubts or fraudy feelings, so I have to work through those by focusing on my mindset. I am committed to my personal evolution as a human and a musician (human comes first). This list will also keep evolving! COMING SOON: MY FIRST ALBUM! And now for the amazing news: I am thrilled to announce that I've received a grant through MacPhail Center for Music (one of the places I teach), funded by the McKnight Foundation, toward recording my first album this summer! All three of these original compositions in Brazilian styles will be included, in addition to a bunch of my arrangements of Brazilian songs, and the whole album will include Tim O'Keefe on percussion, among other guests. I'll be raising additional funds to complete the project, so look for that crowdfunding campaign in the near future, to pre-order the album! I invite you to think about what’s in your personal creativity manifesto AKA what you stand for as an artist. I bet you have more thoughts on this than you realize! What’s the first thing that comes to your mind? Let me know in the comments!